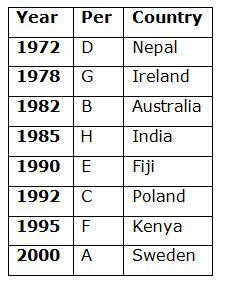 Eight persons A, B, C, D, E, F, G and H are born in same date and month of the different years viz., 1972, 1978, 1982, 1985, 1990, 1992, 1995 and 2000. 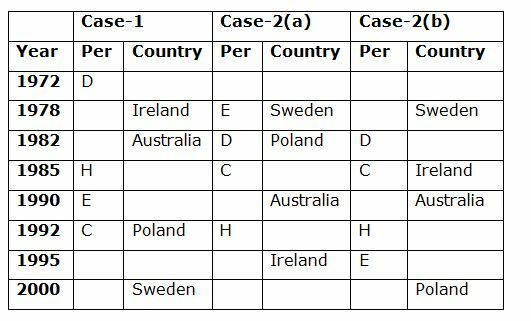 They are all belongs to different countries namely, India, Ireland, Fiji, Nepal, Sweden, Australia, Poland and Kenya nut not necessary in the same order. Their ages were calculated based on the year 2019. 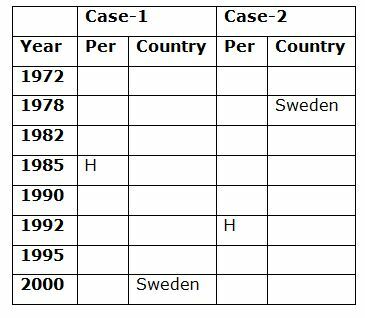 Only three persons are born between the one who belongs to Sweden and H, whose age is neither in prime number nor in multiple of 6. Only one person is born between D and the one who belongs to Australia but none of them born in the odd numbered year. 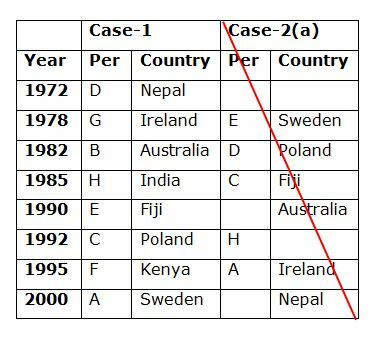 As many persons born before C is same as after the one who belongs to Australia, who was born after D. The one who belongs to Poland was born immediately after E. Three persons are born between the one who belongs to Poland and the one who belongs to Ireland. 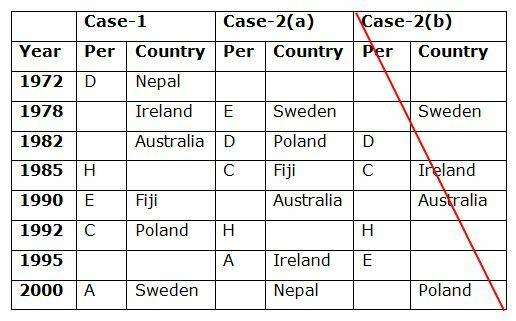 Only two persons are born between A and the one who belongs to Fiji, who is elder than A. More than two persons born between the persons who are belongs to Fiji and Nepal. As many persons born between C and the one who belongs to Kenya is same as B and the one who belongs to India. G’s age is not in even number. 1. H belongs to which of the following countries? Only three persons are born between the one who belongs to Sweden and H, whose age is neither in prime number nor in multiple of 6. The one who belongs to Poland was born immediately after E. Three persons are born between the one who belongs to Poland and the one who belongs to Ireland. Only two persons are born between A and the one who belongs to Fiji, who is elder than A. More than two persons born between the persons who are belongs to Fiji and Nepal. As many persons born between C and the one who belongs to Kenya is same as B and the one who belongs to India. G’s age is not in even number. 4. How many persons are born between G and the one who was born in 1992? 5. If B is related to India and C is related to Kenya in a certain way. Then, D is related to which of the following? 6. How many elements are there in between ’92’ and ‘47’ in step IV? One number and one word is taken simultaneously and kept alternatively at beginning and end of the row. The numbers are taken in descending order. The words are taken as per the English dictionary order and the letters are eliminated as per the step number. 7. Which of the following elements is fifth to the left of ‘valuation’ in the Step III? 8. If ‘92’ is related to ‘documen’ in Step II and ‘63’ is related to ‘examinati’ in Step IV. Then, ‘21’ is related to which of the following in the last step? 9. In which of the following steps the number of elements in between ‘21’ and ‘47’ is maximum? 10. Which of the following elements is third to the left of fourth from the right end in Step II? 1) H belongs to which of the following countries? 4) How many persons are born between G and the one who was born in 1992? 5) If B is related to India and C is related to Kenya in a certain way. Then, D is related to which of the following? 6) How many elements are there in between ’92’ and ‘47’ in step IV? 7) Which of the following elements is fifth to the left of ‘valuation’ in the Step III? 8) If ‘92’ is related to ‘documen’ in Step II and ‘63’ is related to ‘examinati’ in Step IV. Then, ‘21’ is related to which of the following in the last step? 9) In which of the following steps the number of elements in between ‘21’ and ‘47’ is maximum? 10) Which of the following elements is third to the left of fourth from the right end in Step II?